Us, as soon as you’ve shaken off the chills it leaves you with, will send you off on a Google mission. First, you’ll look up the full text of a particularly apocalyptic verse from Jeremiah. Next you’ll look up Hands Across America, the Reagan-era charity stunt in which about 5 million Americans linked hands across the country for 15 minutes to fight hunger and homelessness (the actual numbers are dubious, but they did get a killer Toto song out of it). An ad for Hands opens Us, playing on a tube TV in an ’80s-era entertainment console, flanked by VHSes of The Goonies, C.H.U.D., and The Right Stuff. The obvious and not-so-obvious reference points for Jordan Peele’s film (Gaspar Noé uses an identical citational flourish in the opening of Climax) frame a lost chapter of recent American history so surreal that it’s easy to feel as if it must have been a dream, something from a collectively hallucinated alternate timeline. Ideas about a hidden or bifurcated America abound in Us. It’s a home-invasion thriller paired with a more vast and ambitious science fiction conceit — a little Body Snatchers, a little Funny Games. In that regard only it is comparable to Peele’s beloved breakout Get Out; the filmmaker has a great sense of how to counterpoint interpersonal drama with big phenomena. But it’s a messier film than Get Out, in that it never quite gets around to saying the things it’s trying to say. This is not entirely a bad thing; its messiness allows the film to spend more time working up inventive scares than conveying an all-caps complete-sentence message. But Us’s central visual conceit — a family of doppelgängers’ attempt to violently usurp their doubles — is such a rich one psychologically, and only fleetingly does Peele really dig into the dread of that unnatural horror. C.H.U.D. may be invoked in that opening, but there’s a reason it’s scarier to be assaulted by a slightly off version of yourself than a slimy radioactive monster. “Humanoid” is the scariest word in that acronym. The film opens 33 years ago, with young Adelaide (Madison Curry) spending the evening at a boardwalk carnival with her parents. Her parents fight; she wanders off into a hall of mirrors fun house, where she is terrified to encounter a flesh-and-blood double of herself. Flash forward to the present day, with Adelaide (Lupita Nyong’o) happily married to good-natured goofball Gabe (Winston Duke) and the mother of two children (Shahadi Wright Joseph and Evan Alex), all of them en route to their beach house. Gabe toodles around in his new (to him) motorboat, and they all hang out with their friends Josh and Kitty (Tim Heidecker and a hilarious Elisabeth Moss). But a return to the beach where she got lost as a child reveals that whatever Adelaide saw that dark and stormy night in 1986 traumatized her and changed her forever, and now in present day, as if sprung from her nightmares, a quartet of doppelgängers mirroring her family arrive in the driveway, there to take their place. Each of the actors plays their own double as a kind of bad knockoff; a combination of physical acting and uncanny makeup makes each of the “Tethered,” as they call themselves, their own chilling creation. 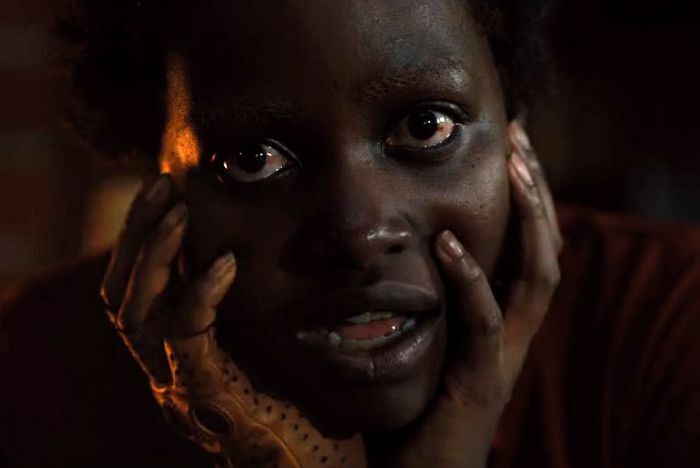 But Nyong’o’s “Red,” as she’s credited, is an achievement on another level; a physical, vocal, and emotional performance so surgical in its uncanniness that it almost feels like it could not be the work of a flesh-and-blood human. It’s an astounding performance, as is her performance as Adelaide, and as the two face off and the nature of their bond becomes clearer, the latter deepens and curdles into something more terrifying. When Adelaide is forced to kill something or one that looks like her own child, you see a light go out in her eyes that never quite comes back. Peele has said in interviews that Us is meant to be a more straight-ahead horror film than the social-horror of Get Out. This may disappoint some fans of the latter, but it’s not an overt racial or social theme that’s missing from Us, so much as a coherence of its internal mythology. The first two thirds of it plays out as a home-invasion thriller with each character splitting off to battle their own Tethered double. But when the explanations and revelations start coming down the pipeline, none of it seems to click in that “aha” way that the best genre movies do. Not just mechanically, but thematically — there are a couple unexplained loose threads, but they didn’t bother me so much as the sense that the big idea they were in service of never quite took shape. When the Tethered first sit down with Adelaide and her family and they ask the obvious question — “who are you?” — Red answers, “We’re Americans.” It’s a loaded line (also a pretty funny one, as is much of Us) and a promise of something that I’d say Peele never quite sees through, even as it clicks into full high-concept sci-fi mode for its final section. But like those VHS tapes on the shelf in the opening shot, Us feels like something meant to be watched over and over until the tape wears down, and we graft our own meaning and nightmares onto it. It, and its unnerving performances, are the perfect conduit for contemporary anxieties about foreign threats, dissociation between our online selves and our physical selves, the sense that all our actions have been preordained by some power outside ourselves.